Bachmann - Thomas the Tank Engine w/Sound & DCC -- Blue, Red - G. Features include: DCC sound-equipped dual-mode decoder for DCC or analog operation whistle, chuff, and cylinder blow down DCC and/or manual volume control with on/off switch polarity switch for operation according to NMRA or Large Scale model railroading practices additional character sound suites available through DCC CV selection only. Character sound suites include Thomas, Percy, James, Edward, Henry, Gordon, Emily, Spencer, and Toby. Whistle or bell per prototype. Moving eyes international-style hook and loop couplers. Once you initiate checkout and before you pay for the order, if applicable, you will see the discount applied to your order's total. This is not something that Train Sets Only can modify. Please keep in mind that most of the electric items we sell are designed for use with 120V AC and come with a North American style plug. Use of products outside the US may require a power adapter and convertor, which are not items that we supply. You an visit the carrier's website for further details on their policies. If you are returning a train set, the shrink-wrapping must be intact and the box unopened. Please inspect your merchandise immediately upon receipt as carrier claims can only be filed within 7 days. The product documentation often indicates when this is the case. Many times, we will simply instruct you to return the product and we will send out a replacement item. Do not return defective items to Train Sets Only unless specifically requested to do so. 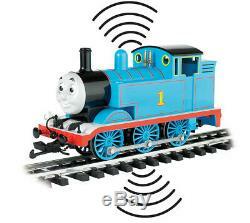 The item "Bachmann Thomas the Tank Engine withSound & DCC - Blue, Red G" is in sale since Thursday, March 21, 2019. This item is in the category "Toys & Hobbies\Model Railroads & Trains\G Scale\Other G Scale". The seller is "trainsets" and is located in New Lenox, Illinois. This item can be shipped to United States, Canada, United Kingdom, Denmark, Romania, Slovakia, Bulgaria, Czech republic, Finland, Hungary, Latvia, Lithuania, Malta, Estonia, Australia, Greece, Portugal, Cyprus, Slovenia, Japan, China, Sweden, South Korea, Indonesia, Taiwan, South africa, Thailand, Belgium, France, Hong Kong, Ireland, Netherlands, Poland, Spain, Italy, Germany, Austria, Bahamas, Israel, Mexico, New Zealand, Philippines, Singapore, Switzerland, Norway, Saudi arabia, Ukraine, United arab emirates, Qatar, Kuwait, Bahrain, Croatia, Malaysia, Brazil, Chile, Colombia, Costa rica, Panama, Trinidad and tobago, Guatemala, Honduras, Jamaica, Antigua and barbuda, Aruba, Belize, Dominica, Grenada, Saint kitts and nevis, Saint lucia, Montserrat, Turks and caicos islands, Barbados, Bangladesh, Bermuda, Brunei darussalam, Bolivia, Ecuador, Egypt, French guiana, Guernsey, Gibraltar, Guadeloupe, Iceland, Jersey, Jordan, Cambodia, Cayman islands, Liechtenstein, Sri lanka, Luxembourg, Monaco, Macao, Martinique, Maldives, Nicaragua, Oman, Peru, Pakistan, Paraguay, Reunion, Viet nam, Uruguay.